Do Paid Music Subscriptions Indicate a Tipping Point? Maybe it’s reflective of consumers’ generally increased willingness to pay for content, now that more paid models are out there. Maybe it’s the launch of legal content services that are really easy to use and represent what users, as opposed to record labels or online retailers, want. Maybe it’s both factors and more. But whatever the reasons, consumer sentiment towards respecting copyright and paying for legitimate content seems to be moving in a positive direction — at least for music. Let’s get one thing out of the way quickly: yes, digital copyright infringement is still massively rampant, and it’s not going away. And the changes I’m observing are small in magnitude. But they indicate trends that could become larger. I’m seeing comments to stories on mainstream tech sites such as CNet News.com and TechCrunch that are more balanced than they have been about the need to respect copyright and ensure that content creators can get paid. As I mentioned last week, the reaction to the recent Copyright Alert System announcement from major ISPs and content owners was more measured than I would have expected. There were even anodyne statements such as “Educating users about copyright is a worthy endeavor” and “…important educational vehicle that will help reduce online copyright infringement” from EFF and Public Knowledge respectively. Could this be a sign that extremism in the “copyright wars” is mellowing? The biggest quantitative sign of a tipping point is that the music industry has reversed its long slide and reported an increase in revenue for the first time since 2004. The overall increase is only 1%, but digital sales are back on the rebound too, at double-digit increases. Pandora’s revenues from paid subscriptions also rose dramatically in the last year. The company’s recent IPO filing documents indicate an increase in revenues from subscribers to its Pandora One paid service (no ads, better sound quality, unlimited skips) from 6% to 9% to 14% over 2008-2010. The difference between subscription music services on the one hand and the Times and Pandora on the other is easily explained as a matter of consumer expectations. Newspapers and “radio” are services that consumers expect to get for free. Getting them to pay was always going to be a tough proposition. But subscription music services have no such legacy in the pre-digital world; they represent a new value proposition. Rhapsody only operates in the US; until now, Spotify only operated outside the US. Now they’re direct competitors. Before its US launch, Spotify had paid subscribership that amounted to about 1.1% of the Internet-connected populations in the seven countries in which it operated. 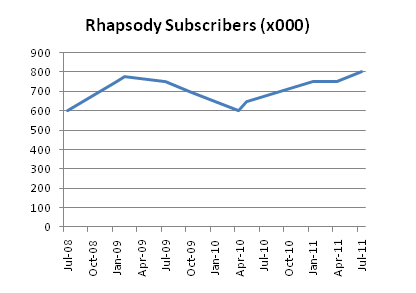 Rhapsody’s subscribership in the US is 0.36% of the net-connected population. Of course, Rhapsody has more direct competitors in the US, including Napster, Rdio, and MOG, though their subscription numbers are smaller. The burgeoning Rhapsody-vs.-Spotify rivalry is generating a healthy buzz about subscription music services that should buoy all of the players. You can see the nature of the competition in blogs and support forums. Rhapsody has more features and a steadfastly loyal subscriber base. But Spotify has a cleaner design and, more importantly, a far better mobile experience than any of the US-based competition. Music has been enjoyed on portable devices ever since the advent of the transistor radio over half a century ago. The use of PCs and Macs for playing music will soon be viewed as a detour from its natural evolution. 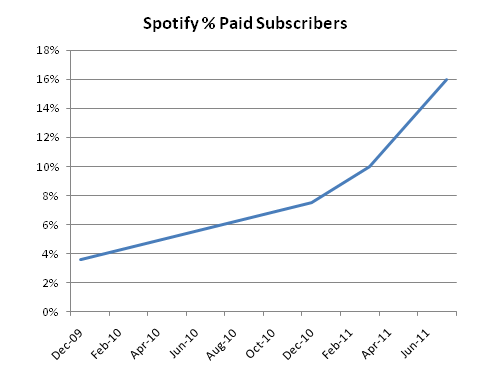 It will be interesting to see how high paid subscription service subscriber numbers climb. It’s the first born-digital business model for music that actually makes money. It may even become a keystone in the re-stabilization of the music business. I’ll report back after Spotify has been in operation in the US market for a year. Don’t believe the paid subscriber numbers reported by Spotify…after all the company is being closely advised by Sean Parker, founder of illegal Napster, who has previously said he wants to eventually turn the screws on Spotify customers. What does “turn the screws” mean? Reduce hours/month for free members? Raise prices? Actually – In my view, the biggest change is because of the news media. The news is under threat; they are the ones who had been rather dismissive of music and copyright before; now that they are under fire they are more sympathetic; thus people’s behavior changes. As they say in the mother country – Bob’s your uncle.